Am I complaining? Heck no! This is awesome, and it’s exactly what happened with the Mudpuppy (Necturus maculosus) study that Dave Mifsud and I are collaborating on. Broadly, we had three goals when we started the project. 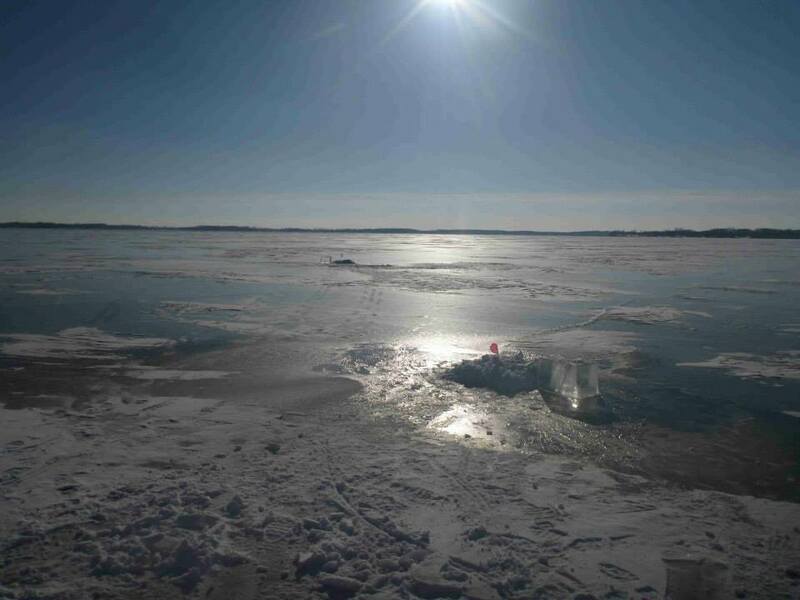 All of this work was to be conducted within the Huron-Erie Corridor here in Southeast Michigan, and the project was funded by the Great Lakes Fish and Wildlife Restoration Act. 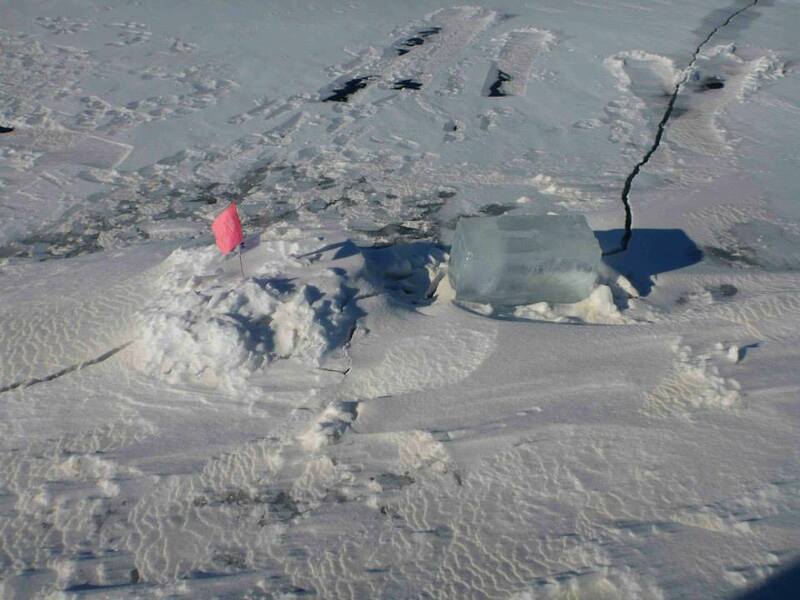 The proposal included a ton of amazing collaborators, including folks from the Belle Isle Conservancy, Michigan Department of Natural Resources, U.S. Geological Survey, U.S. 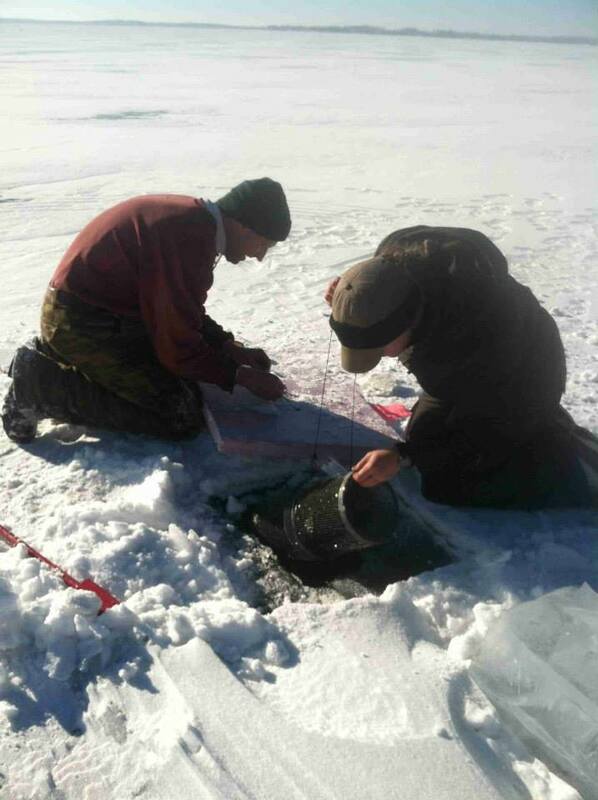 Fish and Wildlife Service, and the Michigan Sea Grant. We already had a fantastic team (GO TEAM MUDPUPPY), and from there the project just seemed to take on a life of its own. I mean, how can you not love these guys??? We found out-of-state collaborators, and out-of-state collaborators found us. Turns out a lot of biologists across the Midwest are concerned about this species. 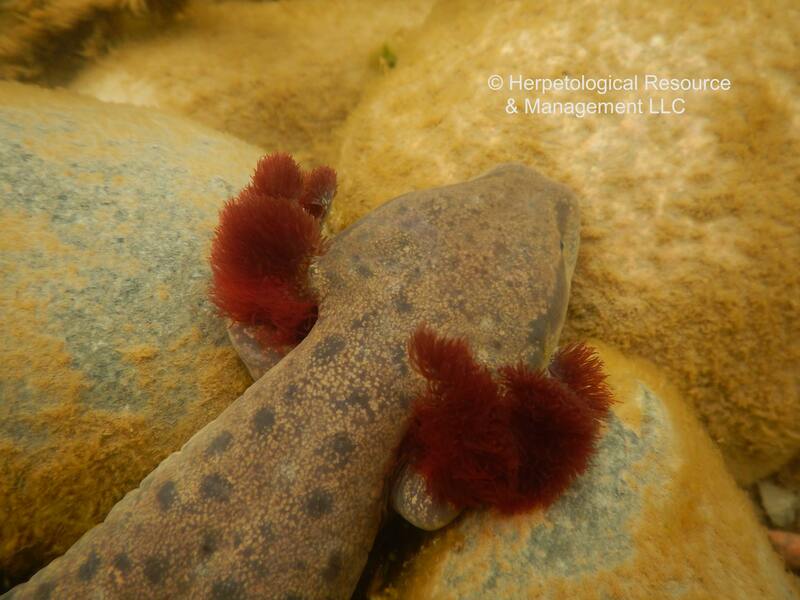 There is lots of anecdotal evidence suggesting Mudpuppies are in decline throughout the region, but there is not a heck of a lot of good data. We’re hoping we can help change that! The type of population genetic analysis we’re conducting can be really valuable in informing conservation actions. First, we can figure out if populations are highly isolated and therefore more likely to die out (this seems likely, given that Mudpuppies are fully aquatic and their river homes are frequently fragmented by dams). Second, we can estimate effective population size, and determine if populations have recently undergone major reductions. 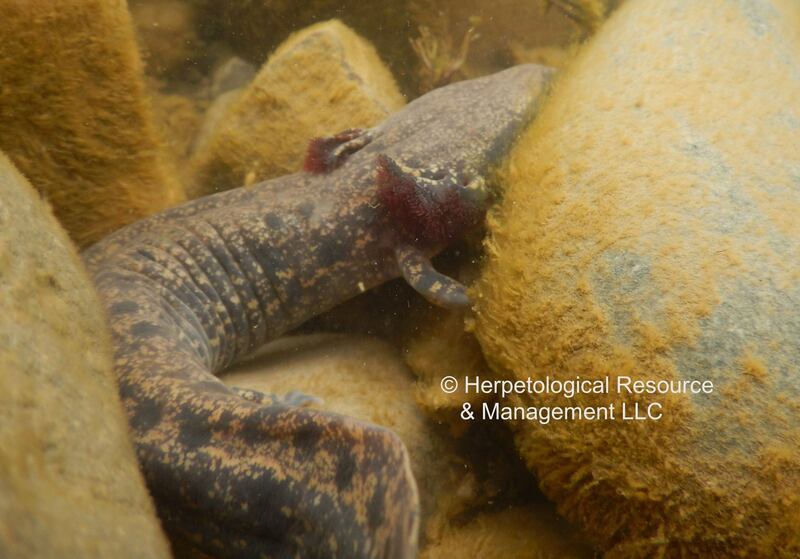 This would be especially informative in areas that are suspected to have lost large numbers of Mudpuppies due to things like pollution, sedimentation, or overexploitation. We’re currently in the depths of processing samples, so I can’t report much in the way of results quite yet. My grad student Amber Stedman has been working on the large-scale phylogeography of the species, and so far we seem to be finding a deep division between eastern and western populations from the Great Lakes region. 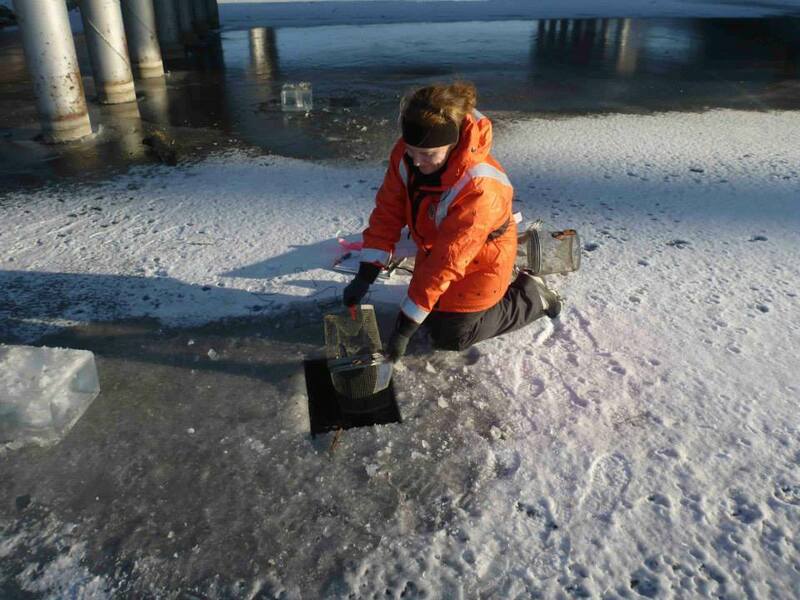 We’re going to end up with an astounding number of samples from Minnesota, due to the efforts of Krista Larson of the Minnesota DNR. 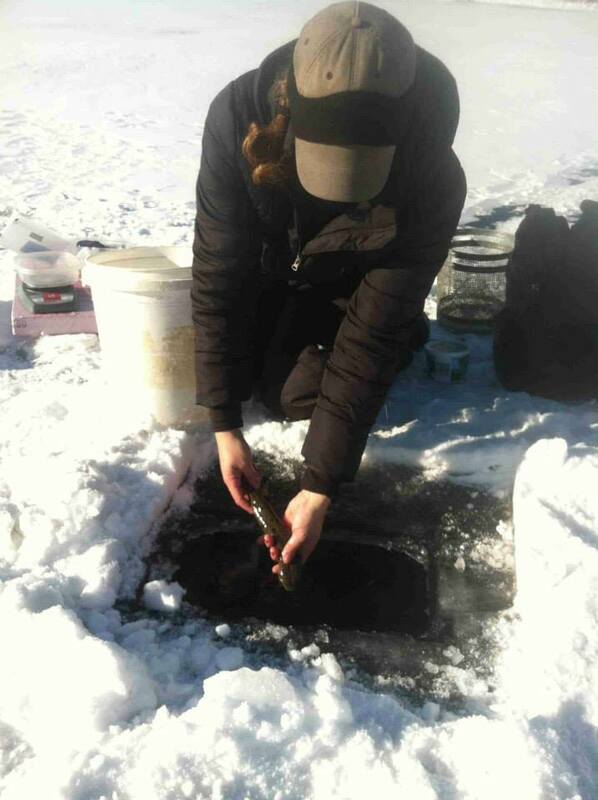 Krista wins my award for “Badass Biologist of the Year”… this is how you sample mudpuppies in Minnesota. I am really excited for what we might learn from these samples. Krista has collected such a large number of samples, and with such great spatial coverage, that we should be able to delineate which populations are at greatest risk of local extinction. 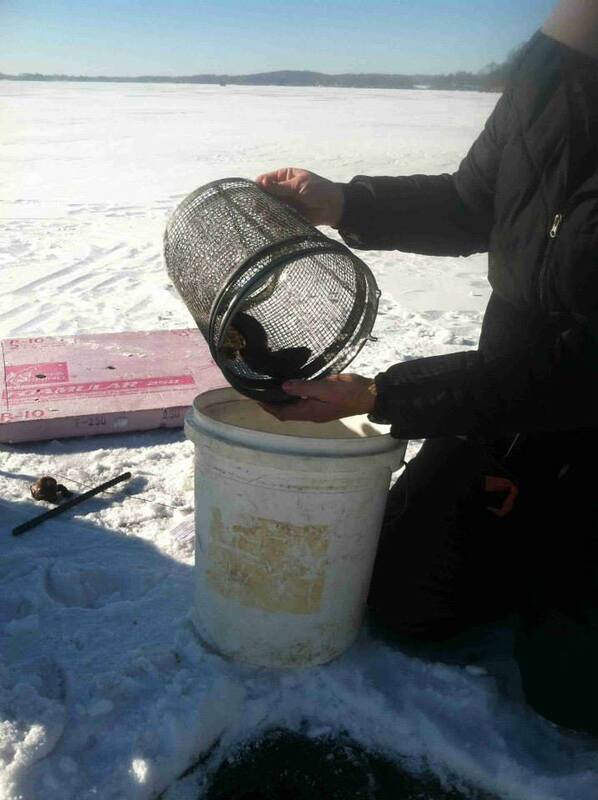 That in turn will hopefully help Minnesota biologists determine the best management practices for this species. This is the research “sweet spot” for me. With amphibians in decline globally, I want to make sure that, as much as possible, the research done in my lab is directly informing conservation actions. 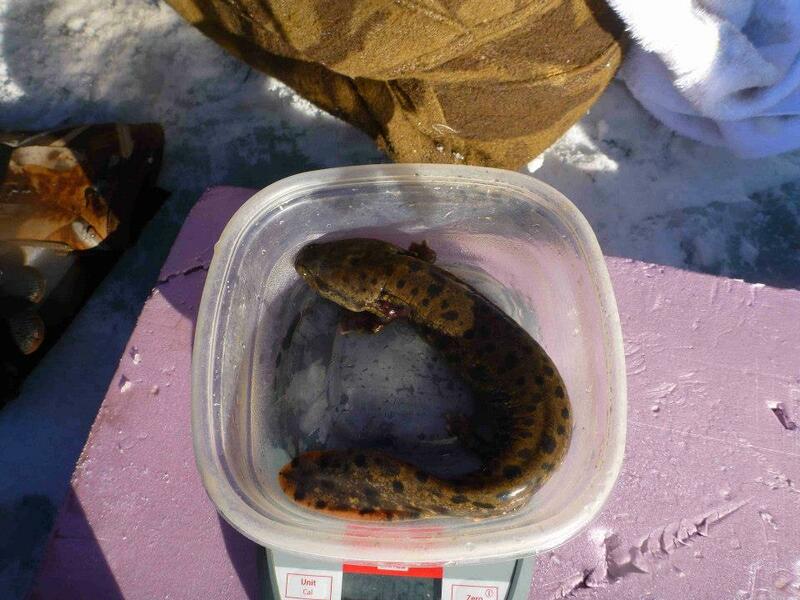 Projects like this Mudpuppy work are golden opportunities to collaborate with people both locally and regionally, and hopefully make “real world” contributions to the conservation of this remarkable species. This has been a fun week for my lab. My second Master’s student, Patrick Terry, successfully defended his thesis on Tuesday. 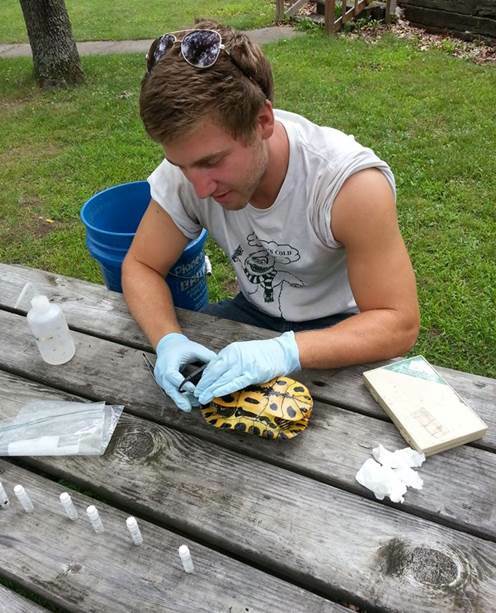 Patrick came to the lab from Ohio University, where he had worked on some turtle projects and developed a strong interest in all things Testudines. Here at EMU, Patrick has been an incredibly independent and self-motivated student, and basically took on developing (and funding!) his own project. 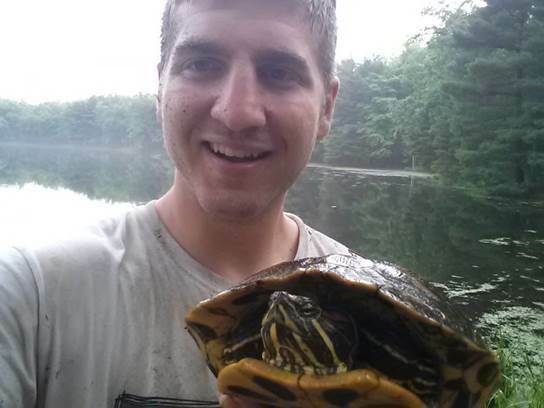 His thesis addresses a long-standing question among Michigan herpetologists: is the red-eared slider native or introduced in the state? 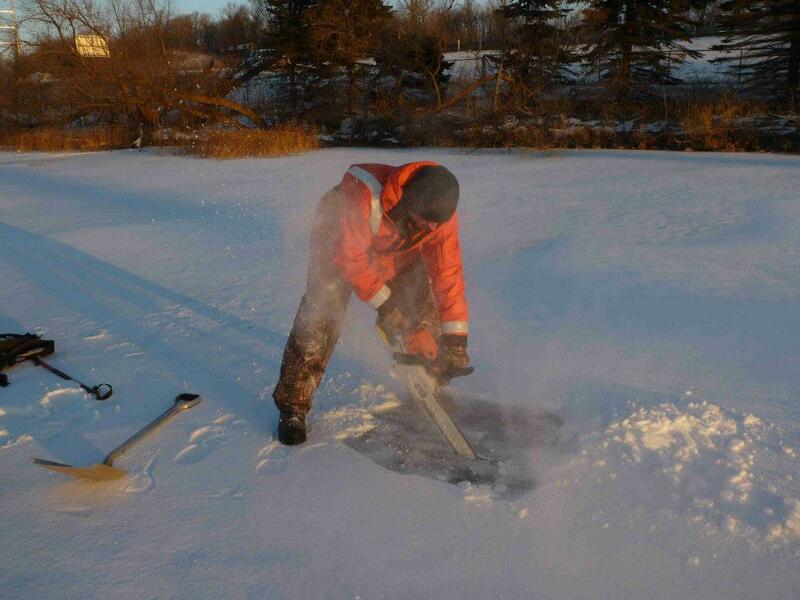 The mystery arises from the fact that we’re at the edge of the native range. 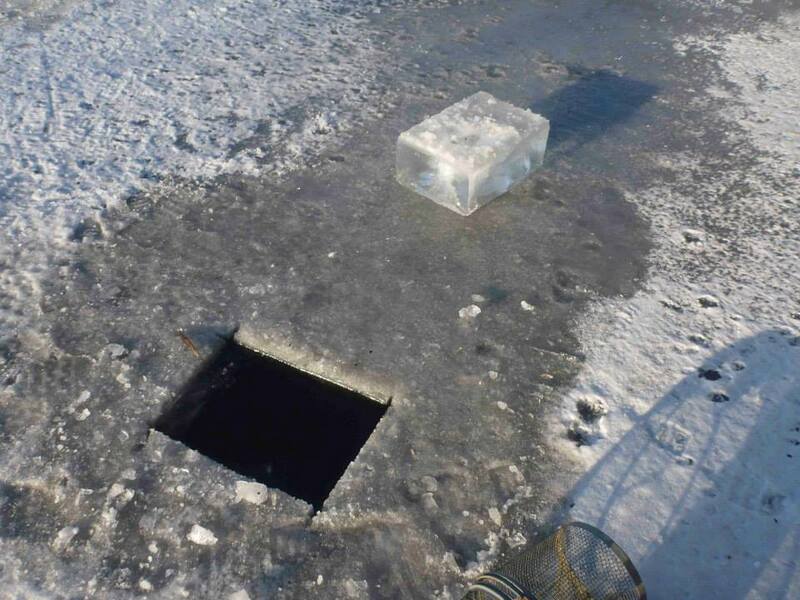 There are some other herps with similarly odd, disjunct populations in the state that are suspected to result from glacial refugia or postglacial recolonization. There is also some (somewhat contentious) fossil evidence indicating that the turtles may have been present in the state long ago. In short, it’s a question that genetic evidence might help shed some light on. 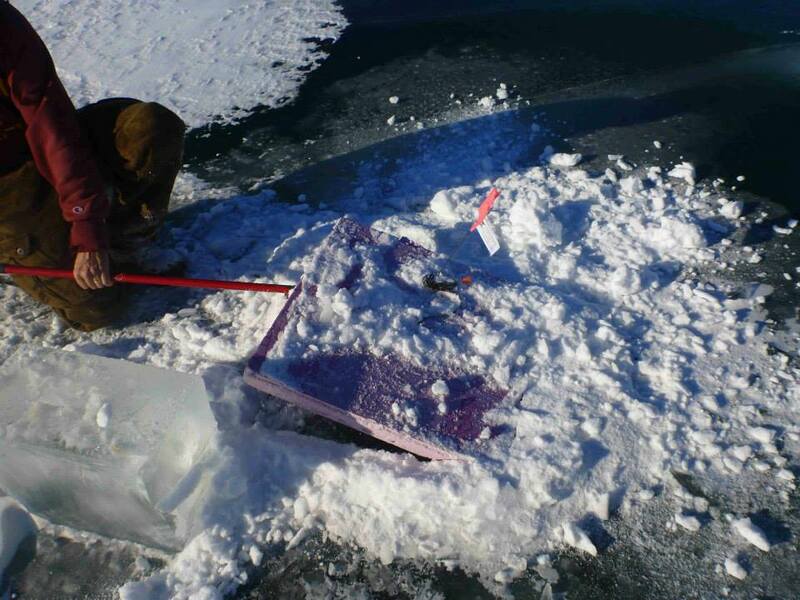 Patrick did a lot of sampling on his own, and worked with collaborators in other states to collect tissue samples for genetic analysis. In the end, he had sufficient sample size from three populations in Michigan, two in Indiana, and one in Ohio. 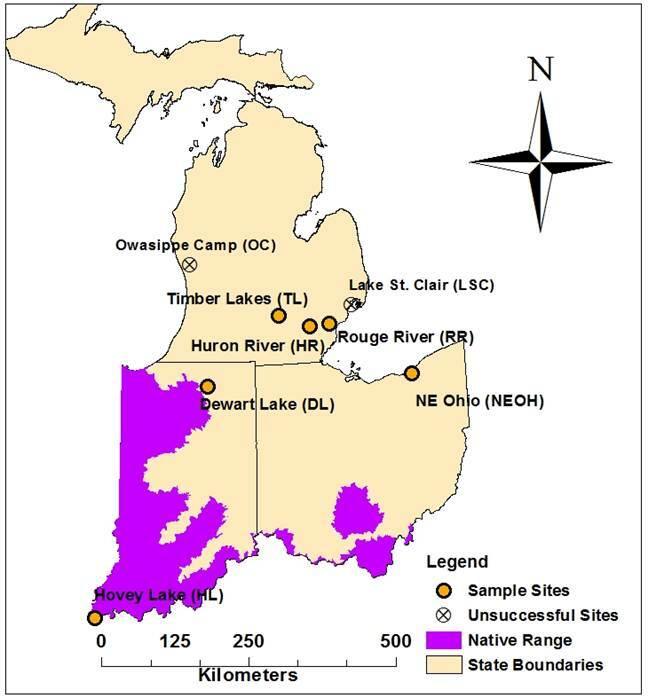 This was a nice set for comparison, because the Indiana sites were within the native range of the turtle (purple in the map above), as it is currently understood. The Ohio population is well outside the range and considered introduced. Patrick conducted a whole suite of analyses to look at how his populations compared to one another, and they all had the same answer: one of his Michigan sites is very different from the rest of the sites, which are all quite similar to one another. The picture below is a visualization from the program Geneland. This is basically a “heat map” showing how likely it is that various sampled sites cluster together. You can see that most sites are quite similar (all the red-orangy-ness). But there is one, TL, which is “white-hot-different.” All of the results reflected this same pattern. Among the sites Patrick sampled, it looks like that one is a likely introduction (and probably from a fairly distant source population). The other Michigan sites are more ambiguous. They may be naturally occurring, or they may be introduced from more regional (genetically similar) source populations. 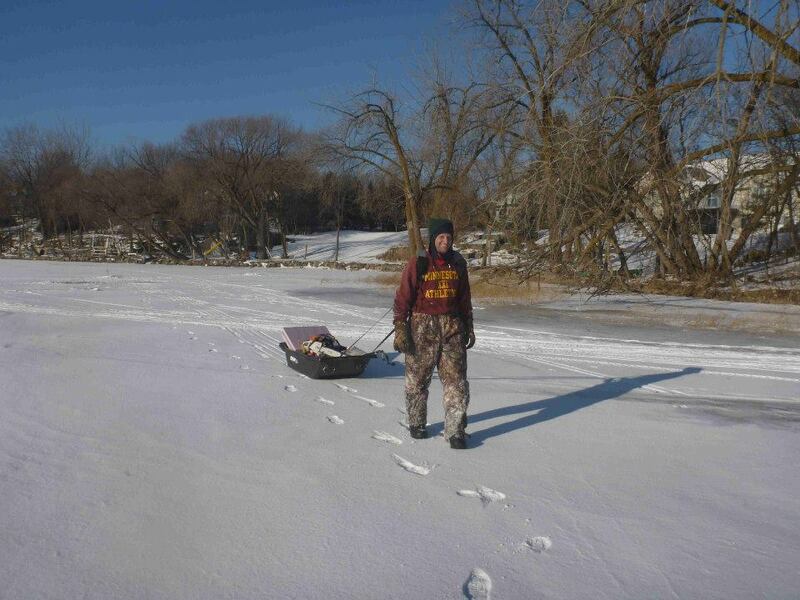 Patrick is preparing a manuscript for submission, so keep an eye out for the full report soon! 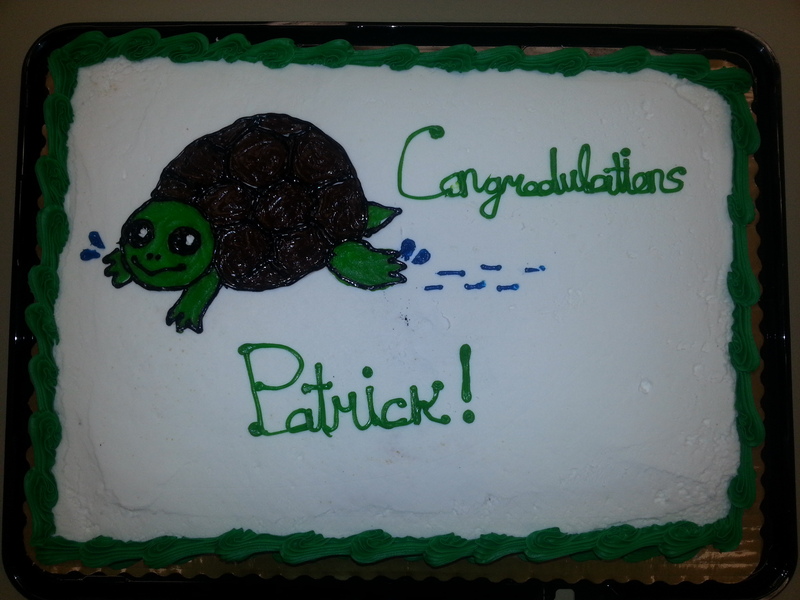 In the meantime, congrats to Patrick on the terrific work and the shiny new degree!